In the twenty-five years that I have sold and trained salespeople the number one objection that salespeople struggle with is the price. 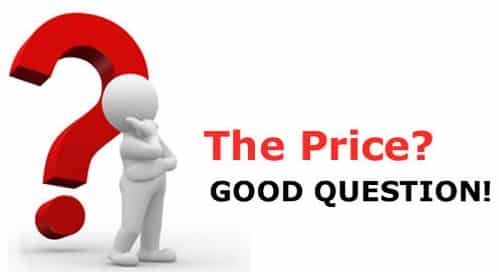 It does not matter what the economy is doing or where the product or service is positioned most salespeople fall apart when confronted with a price objection. If salespeople have any control over price or discount they will give it all away in an instant when the customer makes any kind of comment about price. Small businesses starting out often under value their service in the hopes of gaining a following – this is a poor choice. The truth is that price is rarely the deciding factor in any purchase. Take a moment to think about the things that you have bought – your choice of car, smart phone, computer, and food in your kitchen, clothes. Do you buy the cheapest option? The truth is most people by mid-range products made by brands that inspire confidence. So why is price so often raised by prospects? When a prospect challenges a price what they are really doing is asking the salesperson to prove the price. If the salesperson understands the product, the market and the value the product delivers they can intelligently support the value of the product. Why do salespeople struggle with price? Salespeople struggle with price because they don’t believe or haven’t been trained in the intrinsic value of the product. Why is your product worth what you charge? What value does your customer receive by purchasing your service? What is the return on investment? Superior after-sales service and backup. Better value for money or quicker payback on the customer’s investment. Added benefits such as free installation or training. Come up with a package of advantages that distinguish your product or service from the competition and train staff to divert customer attention away from price using this ‘bigger picture’. Learn the step-by-step process of dealing with all price objections! Click Here!